Hello there! 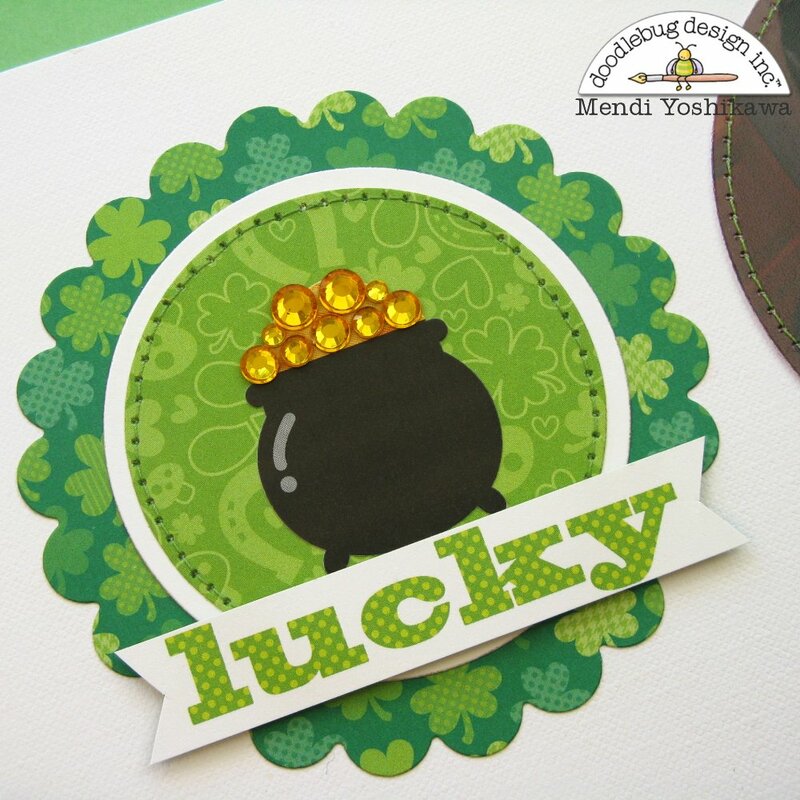 It's Mendi here today with a layout using the aptly named Happy-Go-Lucky collection! The stickers and characters in this line just make me smile! For this layout, I turned to a fun sketch by Creative Scrappers as my jumping off point. I had a blast embellishing each circle on the sketch like a mini canvas. For those of you who are intimidated by scrapbooking, this is the perfect way to get past your fears and break things down into bite sized pieces. For this little circle, I layered the pot of gold sticker with some mini bumblebee jewels. I love adding small touches like this to my stickers to make them special. To ground the bottom half of my page, I added a series of scalloped borders. Some of the prints were getting lost and blending into one another so I decided to punch a second border from the lighter green patterned paper to act as a little divider between some of the busier prints. 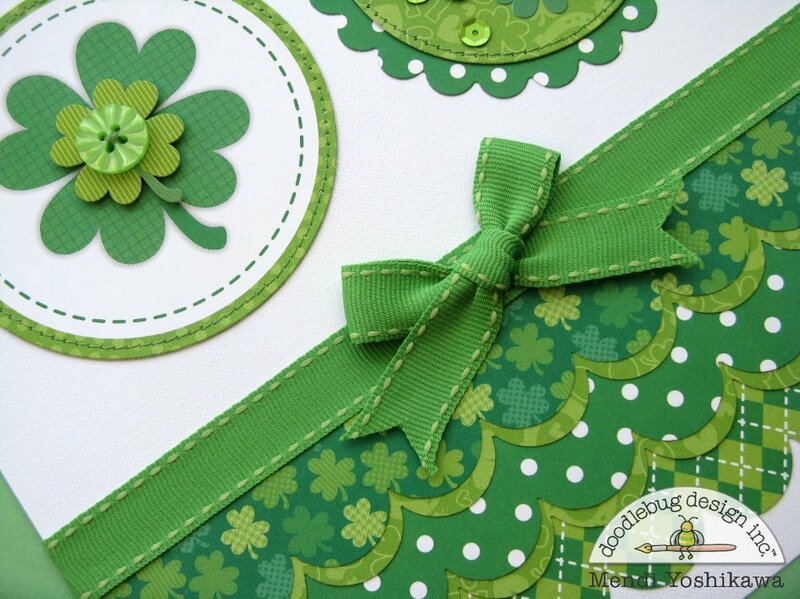 St. Patrick's day papers are hard to come by and this is such a fun collection with so many great prints! I can't wait to make something else with all the fun rainbow motifs for a completely different look! Such a sweet layout Mendi! Love the layers & the circles!!! I won this collection from Doodlebug and can't wait for it to come so I can use this beautiful layout with my family photos. Great design! Thanks Doodlebug!!! WOW - I just saw this on Mendi's blog and come over here and gush too!! I love her work and all the creative things she thinks to do with the papers, and embellishments from you awesome people at Doodlebug Design!!! What a fun page with the scallopped border and the awesome circular mini "canvases" she crafted!! Oh what a fun layout with a great collection!!! Adorable layout, love the fun design! All of those circles with the embellishments and picture are wonderful! Love the borders at the bottom too! Mendi your LO's are awsome, the way you "play" with colors and patterns is so cool!!! I really love the gold of your pot (jewels)!! love the circles and the stitches!!! Super sweet layout! 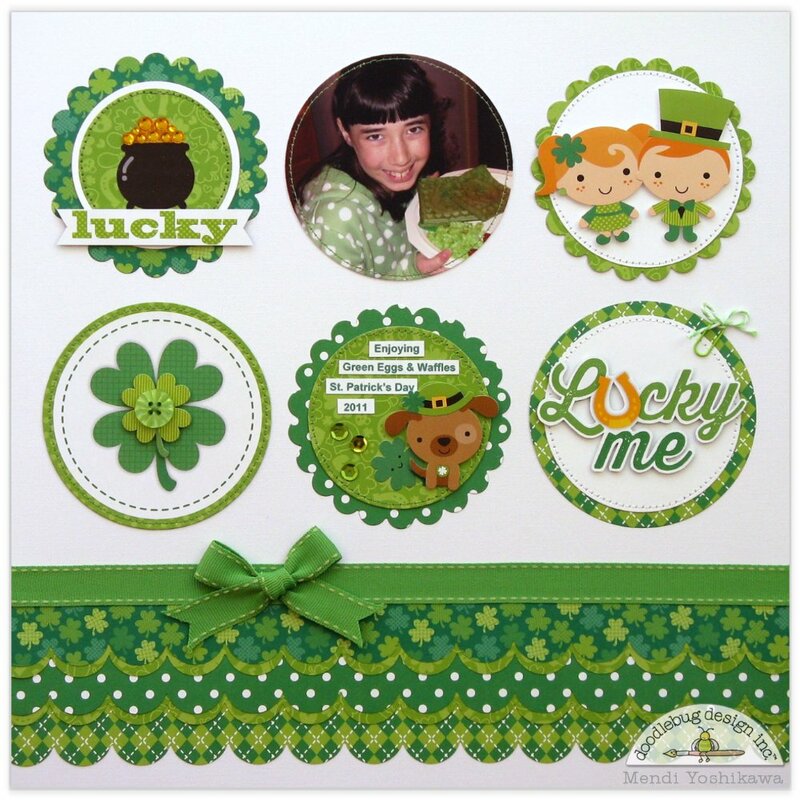 I just love green and I adore how you used the different stickers and embellishments! Thanks so much for sharing and inspiring! A Doodlebug Design Star in the making! Awesome, Mendi! You have an excellent eye for color AND design. Keep up the good work...will look forward to seeing more from you since I am a devoted Doodlebug fan! OMG What a super cute, clever and very creative LO!! I love it allot!! You are one very talented scrapper....and yes awesome products but hey it's the talent that makes it look this great....and girl you've got the talent love the way you scrap!! YOU ROCK!! LOVE your FUN scalloped design!!! Happy-Go-Lucky is an AWESOME collection!! !